North African in origin and hugely popular in Israel, shakshuka is the one-pan, bear hug of a dish that you’ll want to eat for breakfast every morning—and then again for dinner every night. It’s also one of the most flexible meals around. 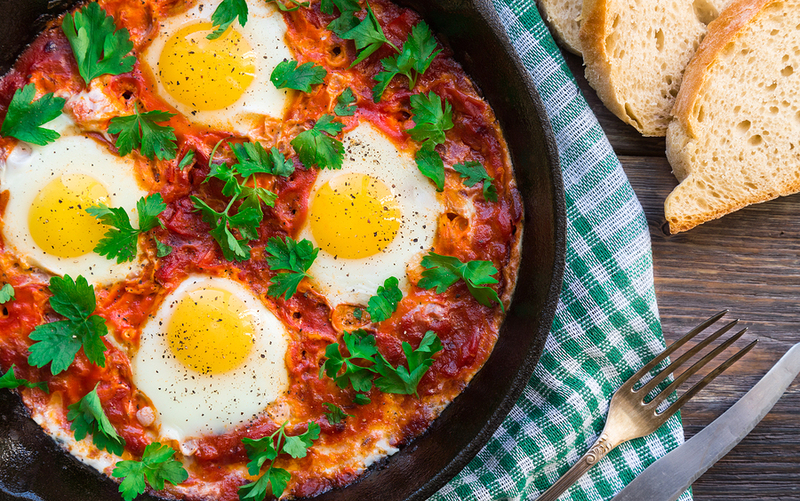 Take some creative liberties and add a little sultry Spanish flair to your shakshuka with this recipe from Old Europe Cheese. Place a large oven-safe skillet (such as cast iron) over medium-high heat. Add the oil and chorizo and cook until chorizo is slightly crisped. Add the onions and peppers and sauté five minutes, or until tender. Add the garlic and cook 2 more minutes. Add the tomatoes, paprika, cumin, chile flakes, and season with salt and black pepper to taste. Stir well, then lower heat and let simmer 10-15 minutes or until slightly thickened. Use a spoon to make a small well in the tomato sauce and crack an egg into the hole. Repeat with the rest of the eggs, scattering them around the pan. Transfer to the oven and let cook 7-10 minutes, or until the egg whites are fully cooked and the yolks are just set. Remove from the oven and sprinkle with Reny Picot Mantoro and cilantro. Serve immediately alongside a sauce-absorbing vehicle of your choice: pita, country bread, couscous, and rice all make perfect plate mates.